Ok, maybe not EVERYTHING, but some things must go. 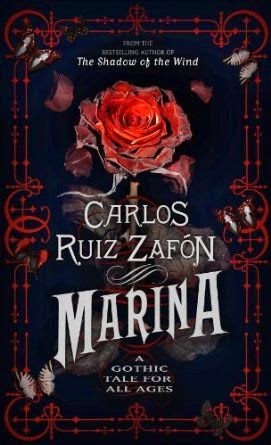 Like, for instance, three copies of MARINA by Carlos Ruiz Zafon! Thanks so much to Mitch, if you don't know Mitch, you should introduce yourself immediately, we have a bunch of audiobooks to give away. Today we have three copies of MARINA. US only, as they're being shipped straight from Hachette Audio. When 15-year-old Oscar Drai suddenly vanishes from his boarding school in Barcelona, no one knows his whereabouts for seven days and seven nights. His story begins when he meets the strange Marina while he's exploring an old quarter of the city. She leads Oscar to a cemetery, where they watch a macabre ritual that occurs on the last Sunday of each month. At exactly 10 o'clock in the morning, a woman shrouded in a black velvet cloak descends from her carriage to place a single rose on an unmarked grave. When Oscar and Marina decide to follow her, they begin a journey that transports them to a forgotten postwar Barcelona - a world of aristocrats and actresses, inventors and tycoons - and reveals a dark secret that lies waiting in the mysterious labyrinth beneath the city streets. My favorite audiobook is "The Scorpio Races." Having two people read the book from two character's point of view, with the awesome accents, nails it! Yes, many of his older stories. Love his numbered series! I read his Alex Cross and the Maximum Ride series.